Summary: Recent events, such as the Greek election and the speeches of GOP congressmen, suggest it was premature to declare the “end of history”. As the post-WWII era ends, each day brings forth new developments from the basement of humanity’s collective mind and soul. We must wait to judge, but such political developments suggest that so far what’s emerged are monsters. It has long been one world. Social, political, and economic trends emerge across the developed nations, denying the existence of borders, varied cultures and languages. For a powerful analysis of one such period see Three New Deals by Wolfgang Schivelbusch, “Reflections on Roosevelt’s America, Mussolini’s Italy, and Hitler’s Germany, 1933-1939”. In many ways three (4, including Japan) different revolutions, but with profound commonalities. Now a similar cycle may have begun. Across the world nations are ruled by two opposed but like coalitions, together defining a narrow zone of solutions — together blocking alternative paths. That works during prosperity, generating confidence in national leaders. But the crisis that began in 2007 has no visible end, and each passing month weakens the developed nations. Slowly people turn to the political extremes for solutions. Unfortunately, most leaders on the extremes are crazy (usually in a non-clinical way). This probably will not end well. Parties must exceed a 3% threshold of the vote to be represented in Greece’s parliament. In the last general election in 2009, Golden Dawn received only 0.29%. It has seen its support jump as a wave of anti-immigrant sentiment has spread in financially devastated Greece. Golden Dawn leader Nikolaos Michaloliakos said his party had delivered a blow against the country’s corrupt leadership. Pasok appears to have lost second place to the Coalition of the Radical Left, or Syriza, which roughly tripled its share of the vote to 15.5%-18.5%. Syriza could end up forming a government if New Democracy fails to do so within 3 days. The parties Syriza represents include the Coalition of Left Movements and Ecology and a revolutionary-Marxist group called the Internationalist Workers’ Left. Syriza leader Alexis Tsipras recently explained that while the group isn’t set on leaving the euro, it will put an end to Greek “sacrifices” that serve only “oligarchs, the plutocrats, big capital.” But Syriza wasn’t the only surprise winner on Sunday. The KKE Communist Party also did better than expected with 7.5%-9.5%. The results of this election suggest discord among partisans. None with enough strength to act boldly. None with clear and realistic ideas how to pilot Greece though this crisis to safe waters. Update: for a brief and cogent look at the election results see this note by Harris Mylonas (Asst Prof of Pol Sci at George Washington U). (3) Palestinians who don’t like having “limited voting power” can move to Jordan. There are, of course, people who say that Israel already practices apartheid. Their argument: Israel has ruled West Bank Palestinians for 45 years, shows no signs of ending the occupation (and indeed keeps expanding the settler population), and doesn’t let these Palestinians vote in Israeli elections even though Jewish settlers in the West Bank do get to vote. The counter-argument is that, since the West Bank isn’t part of Israel, the policies that prevail there can’t make Israel an apartheid state. Joe Walsh’s plan would end the argument once and for all, making apartheid official Israeli policy. Offhand, I don’t recall a member of Congress in my lifetime saying anything so grotesquely at odds with American ideals about ethnic relations and for that matter basic human rights. Will the Anti-Defamation League denounce Walsh? Will the American Jewish Congress? Will AIPAC have anything to say about the congressman whose strongly pro-Israel views its newsletter approvingly highlighted? If not, why not? Unfortunately there are many more examples. Previous Post Is a new tech cycle starting that gives barbarians military parity with modern armies? Next Post Do we have a shortage of workers, or just cheap employers? Part one of two. FM remarks “Our leaders advocate extreme, even evil, policies.” It’s hard to think of more extreme or evil policies than ordering the kidnapping and torture of your own citizens, starting unwinnable counterproductive wars of aggression, and ordering the murder of your own citizens without trial or even charging them with having committed a crime. Am I talking about Bill Clinton? Or George W. Bush? Or Barack Obama? 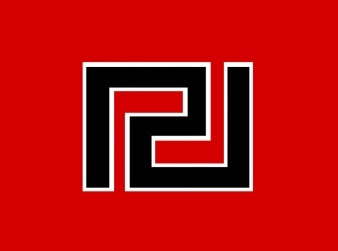 What is it with that color scheme that the fascists like so much? In mein kampf, Hitler pointed out a piece of pop anthropology, that happens to be true: primitive tribes don’t have specific words for all the colours. Very simple societies only differentiate between ‘light’ and ‘dark’, later they introduce a distinction of ‘red’, only a greatly advanced society has words for purple, green, orange, etc. (Homer knew no word for ‘blue’ for example, and the Welsh none for ‘green’; and the modern word ‘grey’ just three centuries ago in France referred indiscriminately to grey and brown, hence the ‘grey eminence’ was the man in the brown robes.) Light, dark and red are also the first colours that children distinguish. The point being, that by using the psychologically simple colours black, white and red, Hitler believed they would engender a society that was more psychologically simple, and incapable of making fine distinctions. Everything would be black and white… plus force. That’s fascinating. Thanks for posting this! That bit of pop anthro is a bit misleading. All ancient languages are exquisitely & deeply tuned to context. The range of color sensitivity in the photodetectors of most sub-populations is remarkably similar, so the fact that they don’t all fractionate the color spectrum the same way means only that it “literally” wasn’t that important for local survival strategies. You can bet that the ability to discriminate unique shades & combinations was available in the specific memory abilities, so an individual was likely to remember the exact shade of a particularly dangerous bear, tiger, etc. They just didn’t spend much time talking about such things, and would possibly paint a picture if necessary, when 1000 words wasn’t quick enough. Anthropology, linguistics & biology is full of such tidbits, where exceedingly complex cultural systems are divergently tuned to different contexts. Most fascinating part in the end is how deeply “tunable” human cultures & languages are. Illinois, the land of neo-Nazis, is somehow now Zionist? What’s that say about the ongoing flavor of Netanyahu/Sharon/Likud Zionism? If Nazism & White Supremacy nearly destroyed Christianity, Zionism may destroy Judaism. In fact, they’re looking a LOT like the same thing, even joining arms! Land holdings & physical power do more harm than help to religion. Separating church & state protects both parts. Let’s hope it’s not too late to let this particular flavor of Judaism wither. I fear that some of us will look back on this someday and realize what an understatement it was. I pray I am wrong. You wrote that Rep. Walsh wants to “tell members of an ethnic group that the land they live on is being given to another nation.” Not exactly a fair statement, since that already happened, way back in 1988, when Jordan ceded the territory. Still, a very well written and detailed post that is greatly appreciated. Fukuyama’s “End of history” comment was particularly ignorant coming from an academic who should know better. I’m just an uneducated guy who reads a few books every now and then and I knew it to be absurd when I first heard it. It was a dramatic way of expressing a forecast. Something many of us have done, now and then. He didn’t mean it literally, after all. But, like all forecasts, it was a high-risk bet. ugh. not good. Didn’t something similar happen in the US during the great depression? Next big business got scared, but more scared of the communists, so they gave money to the nazis. We shouldn’t exaggerate the significance of these events, nor ignore the potential harm if these trends continue. As you note, we see the lessons of the 1930’s. Have we learned them? For a brief and cogent look at the election results see the following note by Harris Mylonas (Asst Prof of Pol Sci at George Washington U). His pre-election report is available here. His book, The Politics of Nation-Building: Making Co-Nationals, Refugees, and Minorities, is forthcoming with Cambridge University Press. It is reposted from The Monkey Cage, an excellent blog by a group of political scientists. This is a historic low for the two dominant parties ruling Greece since the collapse of the Junta in 1974, PASOK and Nea Demokratia. Together they garnered only 33% of the vote. The result was hard to anticipate—especially the second place for the Coalition of Radical Left (SYRIZA), with 16,77%. Less unexpected was the electoral success of Independent Hellenes (10,6%) on the right and Golden Dawn on the far right (7%). A coalition government seems highly unlikely at the moment if one considers tonight’s statements by party leaders. It is interesting to note that more than 19% (!) of the vote was garnered by parties that did not ultimately make it to the parliament. These include: Popular Orthodox Rally – LAOS, Democratic Alliance, DRASI (Action), Dimiourgia Xana (Recreate Greece), Social Agreement (Koinoniki Symfonia), and the Green Party (Oikologoi Prasinoi). Finally, 35% of the Greek electorate—more than 3 million people—did not go to vote. These people may now be regretting their choice to not participate. There are many messages that one can draw. People voted against the two-party system — that can no longer fulfill its side of the “patronage contract” — and against austerity measures. Yet, they voted — at least nominally — in favor of a European future. Another thing that is apparent is that the current electoral law produces odd and hardly representative results. For instance New Democracy received 2 percentage points more than the Coalition of Radical Left but this difference resulted in 56 more seats for the former party. Moreover, as a result of fragmentation of the party system, parties that did not make it to the parliament have collectively received a higher percentage than the first party, which receives 108 seats! The European leaders are numb and will probably wait and see whether a government can be formed before they react to the result. This electoral result was not really expected and it increases the uncertainty surrounding the future of the Eurozone since a stable government in Greece seems unlikely. If we combine the Greek result with Hollande’s victory in France — and the expected friction in Franco-German relations — the markets will most likely react negatively and remain volatile until things clear out. I disagree that Syriza is an example of the “extreme left”. I do agree that Greece’s situation is just similar to that of the Weimer Republic though, hopefully this time the leftists win. Anyway, Syriza may be called “radical left” (although the accurate translation is more along the lines of alternative left), they have actually promoted pragmatic and surprisingly moderate proposals in comparison to others on the left (KKE) and right (Golden Dawn, etc) and in fact weren’t even willing to campaign on leaving the Euro. I think the fact that the vast majority of the protest vote in Greece went to Syriza as opposed to Golden Dawn is actually a good sign, not a bad one. But then again, who knows what will happen.